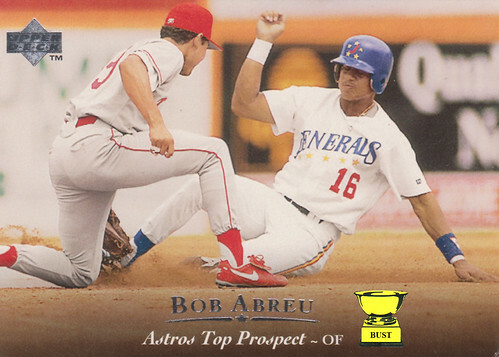 Houston Astros 1995 scouting report on prospect Bob Abreu: "He may be a General, but he keeps showing off his privates. It's really inappropriate. ... Can't seem to match up his wristbands. He may be colorblind. ... Insists that he was the sixth member of Menudo. ... His no-look slides could use some work. ... Has a disquieting knowledge of Motel 6 locations. ... An excellent combination of power and speed. Wait, no, that's my review of the new Chevy Camaro. ... Still trying to find out his middle name, but it must start with a 'B,' because he keeps insisting that we call him 'Bob B.'"